Powerful symbols of remote antiquity, the pyramids have intrigued and fascinated generations. Their secrets are here examined using the latest technology, including the first ever fully illustrated survey of all Egypt’s pyramids. Mark Lehner surveys the history, building, and use of the pyramids in unprecedented scope and detail, looking at the practical aspects—the quarries, ramps, and tools used in building them—as well as the conceptual—the cosmology and iconography of the pyramids and the intriguing Pyramid Texts. 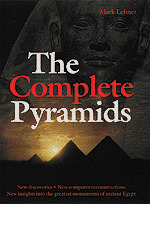 Fully illustrated, The Complete Pyramids is a companion volume to The Complete Tutankhamun and The Complete Valley of the Kings, both published by AUC Press.